Boplaas Family Vineyards has been included in a list of 20 of South Africa’s best Sauvignon Blancs by leading magazine Country Life. The achievement is even sweeter considering that no less than two wines from this Klein Karoo producer were selected. Country Life claims the title as “South Africa’s most trusted source of information and inspiration about country travel and the country lifestyle”. The publication is read by a monthly average of 155 000 readers: “individuals who love the good things in life and, more importantly, can afford them”. The two Boplaas Sauvignon Blancs selected by Country Life for its Top 20 in SA were the Boplaas Eerste Water Sauvignon Blanc 2018 and the Boplaas Bobbejaanberg Sauvignon Blanc Family Reserve 2018. Over the years Boplaas has identified vineyards in cool climate pockets across the Cape region from which grapes are sourced. Some of these vineyards – including those that produce the Eerste Water and Bobbejaanberg Sauvignon Blancs – are located in unique, unexpected and isolated places. The vineyards that produce Eerste Water Sauvignon Blanc are snuggled between the steep mountains of the little-known Groenfontein Valley. The grapes receive an optimal balance of shade and sunlight. Lower temperatures associated with higher altitude and cold nights, coupled with deep shale soils, ensure the wine is typical of cool climate wine excellence, but with character shaped by unique terroir. The name Eerste Water (meaning “first water” in Afrikaans) refers in large part to the location of the valley, which is part of the Swartberg Mountain range. When it rains, the Eerste Water vineyard is first in line to be reached by Swartberg streams of crystal clear, nutrient-rich water. In the glass, the wine’s aromas conjure up notes of passion fruit, oyster shell and white peach with an underlying herbaceous character. The palate is full and shows minerality that is sustained by fine acidic balance through a long, satisfying finish. 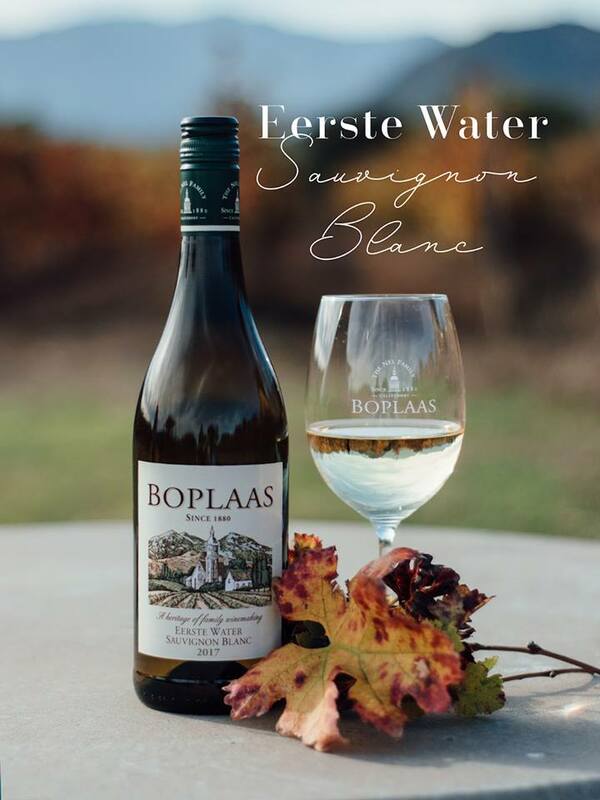 Country Life’s Greg Landman, a veteran food and wine writer, says the Boplaas Eerste Water Sauvignon Blanc 2018 is “delicious, easy drinking”. He advises enjoying it with grilled cob. The Bobbejaanberg Sauvignon Blanc vineyards thrive in soils of decomposed sandstone at an elevation in excess of 650m and located in the Outeniqua Mountains of the Upper-Langkloof ward. Of the 2018 vintage, Landman enthuses: “[The wine is] Great with steamed mussels drenched in butter”. It shows a lime leaf character with subtle notes of white peach, lemon grass, sugar snap pea and green asparagus on the nose. It has a svelte oyster-shell minerality with bright acidity and fynbos elements.